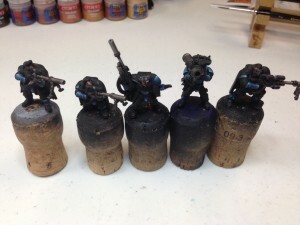 This will be the first part in a series on my collection and painting of my Ultramarine Space Marine Army. 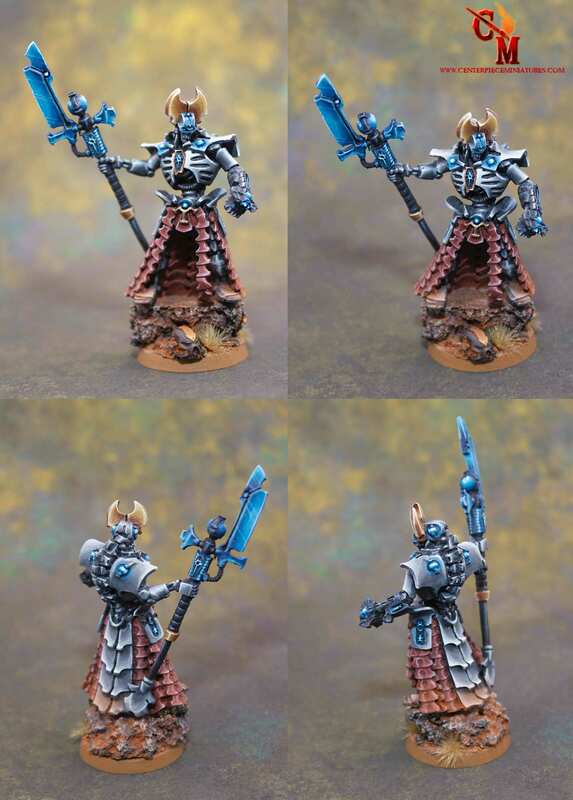 I intend to do put some tutorials as well as ideas, concepts and thoughts as I progress in collecting, building and painting my army. I’ll begin with a small introduction to my war gaming experience. I started war gaming back in Rogue Trader days. 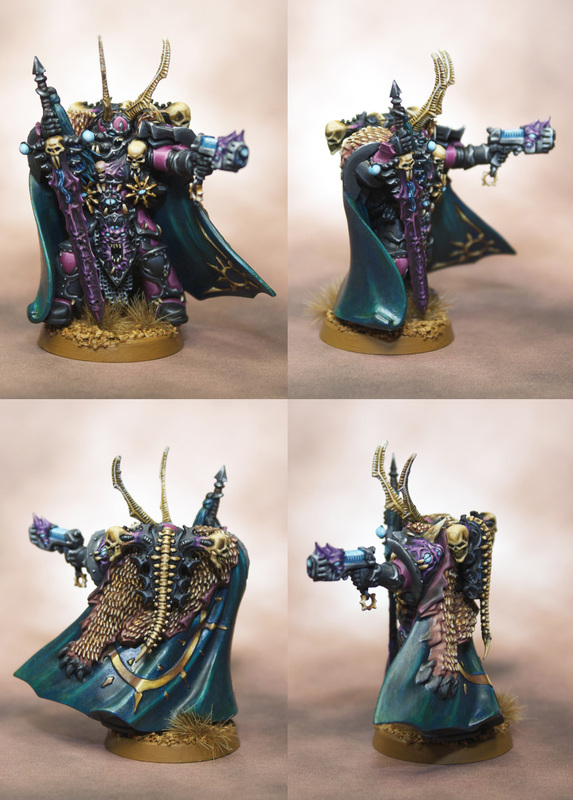 I have always had an Eldar and a Space Marine army through the successive Warhammer 40k editions that came out. I also had worked as a casual at Games Workshop back in the late 90s. In these Golden Days I also collected a faction/gang/armada from each of the specialist games that Games Workshop used to produce (I’m hoping to bring some articles about Necromunda, Mordhiem and others to the site soon). I eventually took a long break from the hobby when the introduction of Warhammer 40k 3rd edition. I sold most of my miniatures and entered other hobbies and started a family. Fast forward almost 15 years later. 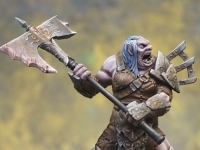 I started playing board games (a lot from Fantasy Flight Games) with friends and decided I enjoyed the painting and social aspect of the hobby. Then I thought where was the old war game hobby that I enjoyed in my younger years up to. 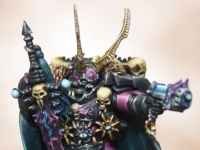 Well I was blown away with where Warhammer 40k and Warhammer Fantasy was at and quickly started gathering miniatures again for the rebuilding of my potential armies again. 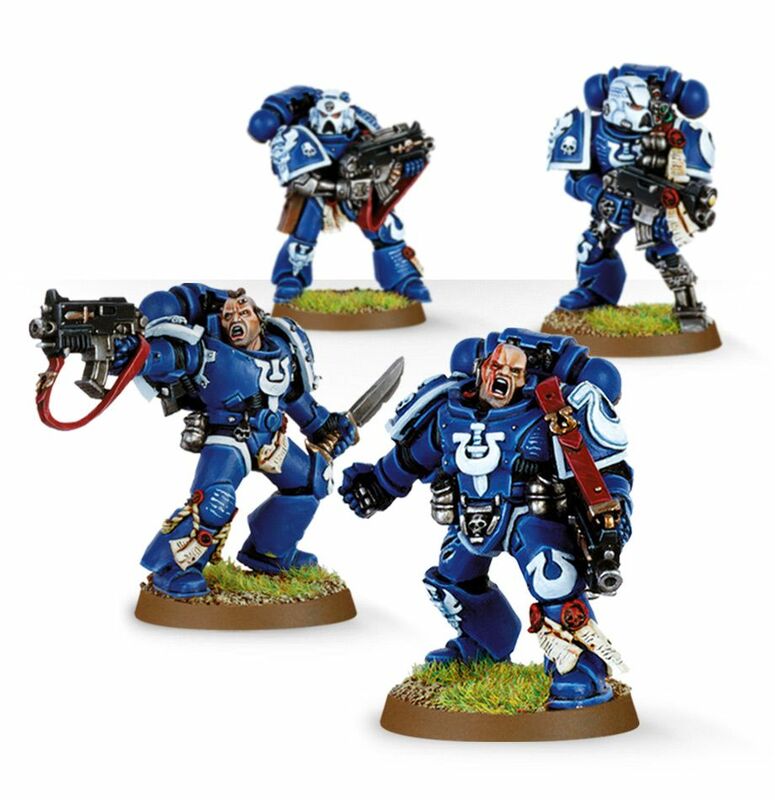 I was always a Dark Angel Space Marine fan but the latest releases in my opinion made them all to be nut job monks (where before they were a more darker/sinister chapter without all the warrior monk over tones). So I then thought I’ll simply move to collect my always favourite secondary army; Sisters of Battle. Well I was shocked to see them so neglected and decided that they may eventually be Squatted and didn’t want to invest in an army that my be eradicated. 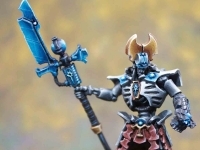 I did look into Eldar as well but in the end went with a generic Space Marine army as it would be financially cheaper (on a per miniature bases) and allow me to branch out into other games from other manufacturers. So which chapter was the next decision. I look over at Forge World and saw that they created some custom vehicle pieces and some custom dreadnoughts and from the major chapters from the Warhammer world. 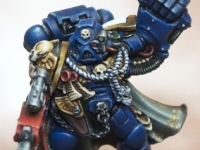 I quickly purchased the latest Space Marine codex and saw immediately that the Ultramarines had the most (numerically speaking) unique characters of all the included codex chapters. 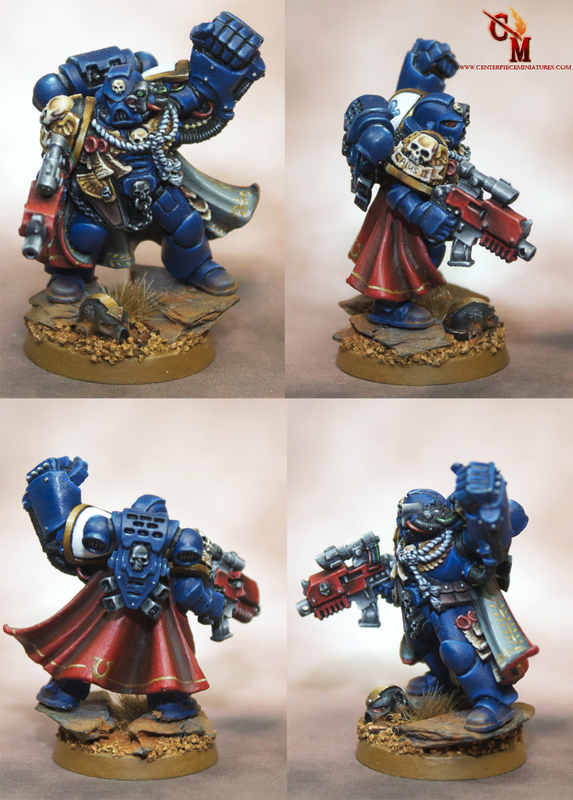 I like painting and so when someone presents me with unique space marine characters then this makes me a happy man. 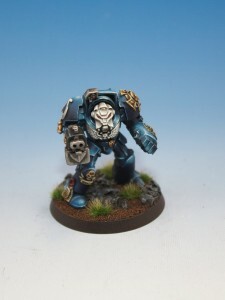 Yes I could have gone with Space Wolves if I wanted unique, but the actual heads of the plastic marines looked horrible – there were some with Mohawks, some with slip knots, some with facial hair from the 1700s old england, some with long beards – just a big mess. Then to top it off there were marines riding wolves… enough said, there was no way I was going near that. I really only collect armies based off looks first, fluff second and rules third. 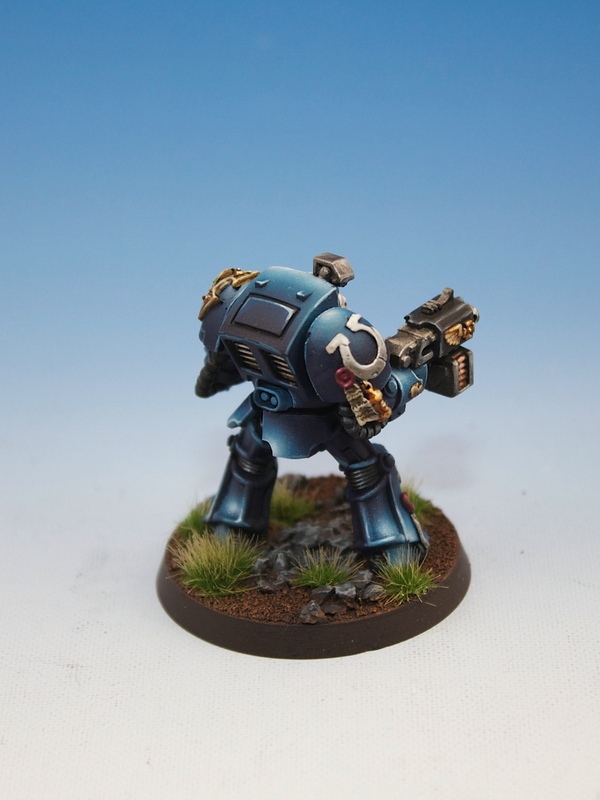 So I decided to go Ultramarines. I quickly got some custom shoulder pads and doors from the vehicles from Forgeworld. I then picked up Marneus Calgar and his command retinue and finally a space marine megaforce box set (the one with a land raider, scouts, land speeder, drop pod, dreadnought and a squad of tactical marines). 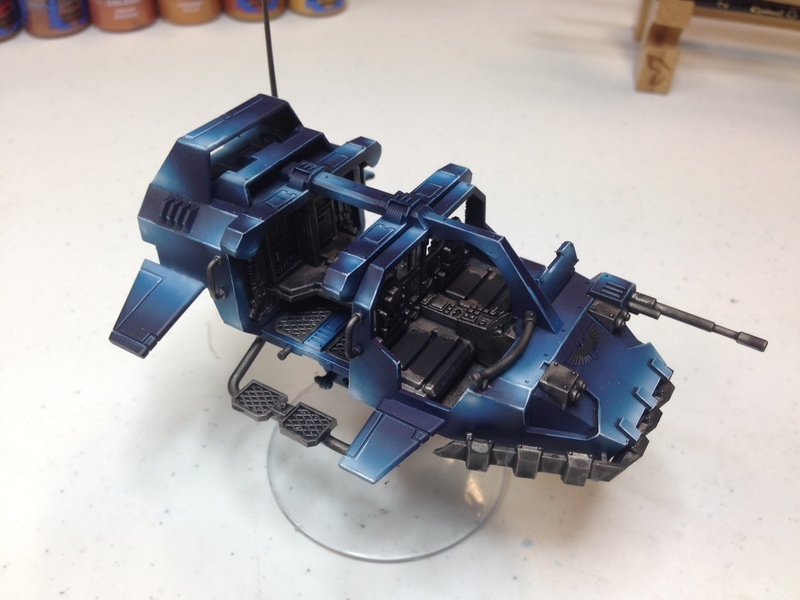 I quickly built all the miniatures and vehicles and…. then they stayed on my ‘to do’ shelf for a year. Centerpiece miniatures business started to take off and all my free time was consumed with commission painting and running the business. 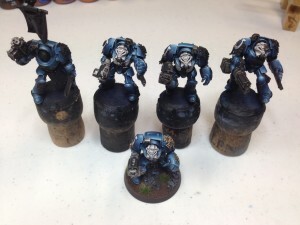 My poor force of Ultramarines did not manage to get paint on them, in fact they never hit the battlefield. 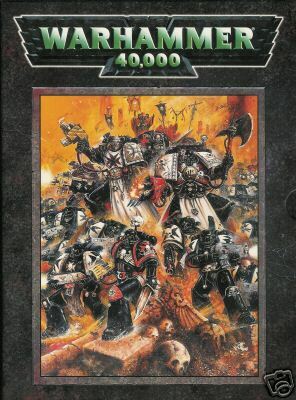 Even to this day, I have not played a game of Warhammer 40k since 1998!!! Recently my absence at the local gaming scene has been noted and quite a few people have demanded that I start to make some sort of appearance again. I finally made the decision that I needed to war game and I wanted to use my poor neglected Ultramarines. So here is where we are at. 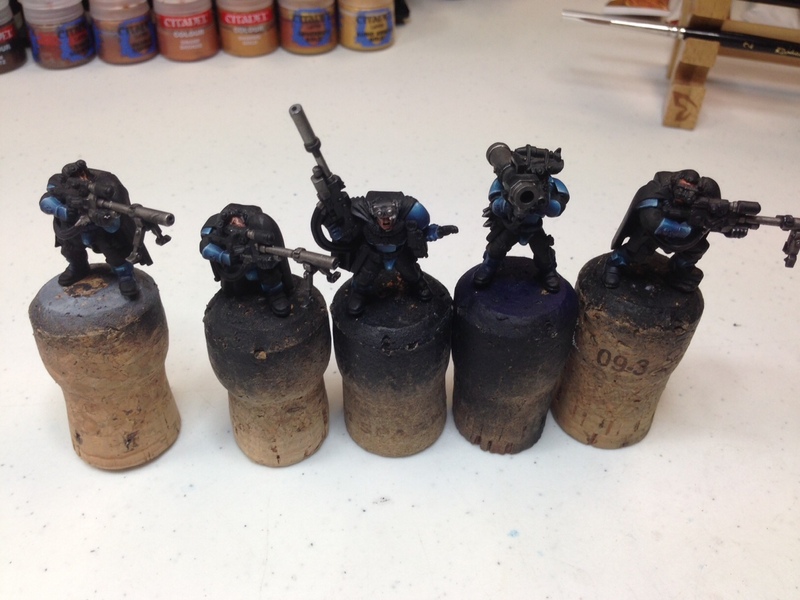 I have a small Ultramarine force completely constructed. I now have every intention of expanding this force. I have very little time free after the business has taken its share and as such I don’t want to get bogged down in painting and leaving little time to play. 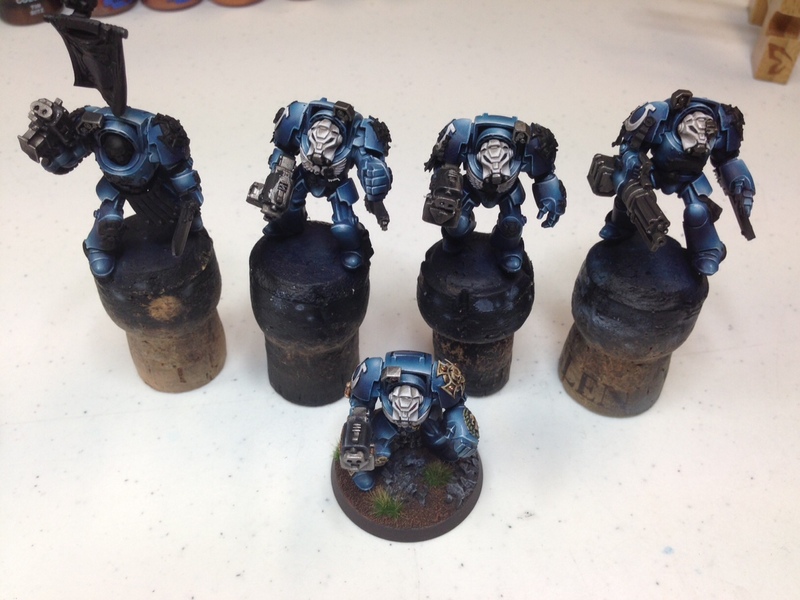 Finally I didn’t want to paint a smurf army of generic Games Workshop studio colour blue for my Ultramarines. I wanted something a little more sinister and darker (it is the Grim Dark future). I decided I was going to airbrush as much of my army as possible to save time, and I was not going to use NMM techniques, again to save time. But on the other hand the miniatures needed to still be pretty enough so not to embarrass me (it would be bad marketing for my business if these ever went to tournaments). First thing to do was come up with a proof of concept. I grabbed the nearest miniature to my workstation which was a lonely terminator and began throwing colours at it. So after a few attempts at colours I came up with the above colour scheme. 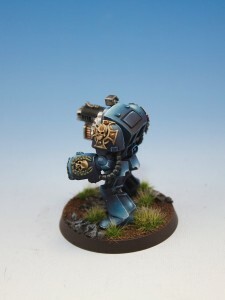 It was suitably dark but not dark enough to be confused with other chapters like the Crimson Fists. Replicating the colour scheme would be very fast so that was another step in the right direction. I decided to go with a rather basic dark brown/green base, again it was fast to reproduce and the colours would compliment the blues (yes I’m starting to use a color wheel from an art shop – if you havent started using these or the basic theory behind this then I highly recommend giving it a look into, it will change they way you paint). After the successful completion of the Terminator, I quickly grabbed some more varied miniatures, some with less blue armour (like scouts), the rest of the terminators and also a couple of vehicles. 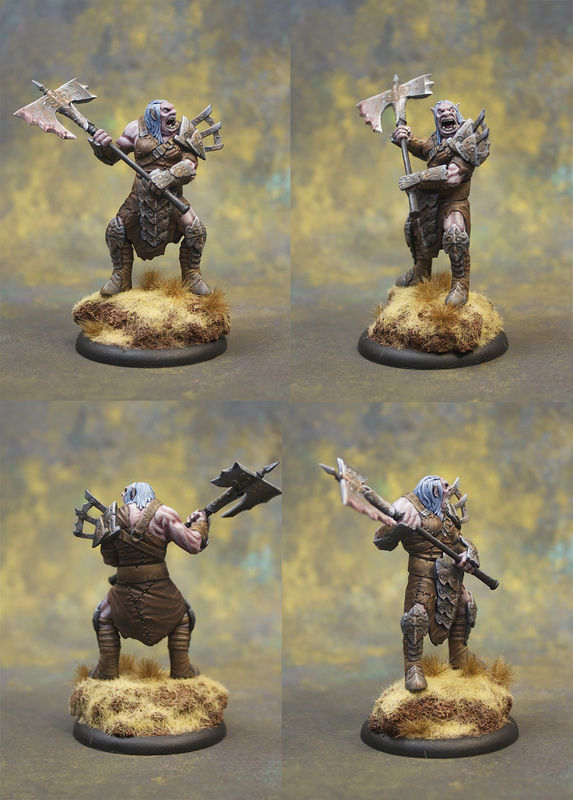 Given the varied difference of blue metal on these miniatures, painting them would give me a good idea as to how long it would take to reproduce the color scheme on to small, medium and large miniatures and to also see how they would look in end as I’m not 100% sold on the color scheme yet. Nice to know that you’re finally going to get back into the gaming aspect of the hobby. You’ve got the painting down pat! The chapter I was going after was the Imperial Fists (the commission you guys did looks fantastic!). Your Ultramarine blue is a bit dark for my preference, but hey, it’s not my chapter. I’m sure you see so many types and styles of painting schemes for customers that having something different is a good thing. Still, they look great! Enjoy! Wow those look great! I really like the scheme but I’m having trouble finding the color steel blue anywhere. Is it a reaper color? Also do you use an airbrush or is that all hand blended? Either way those are some awesome models!! I have noticed that the Vallejo Steel Blue and Dark Sea Blue have the same bottle ID (71.087) so perhaps one had replaced the other. 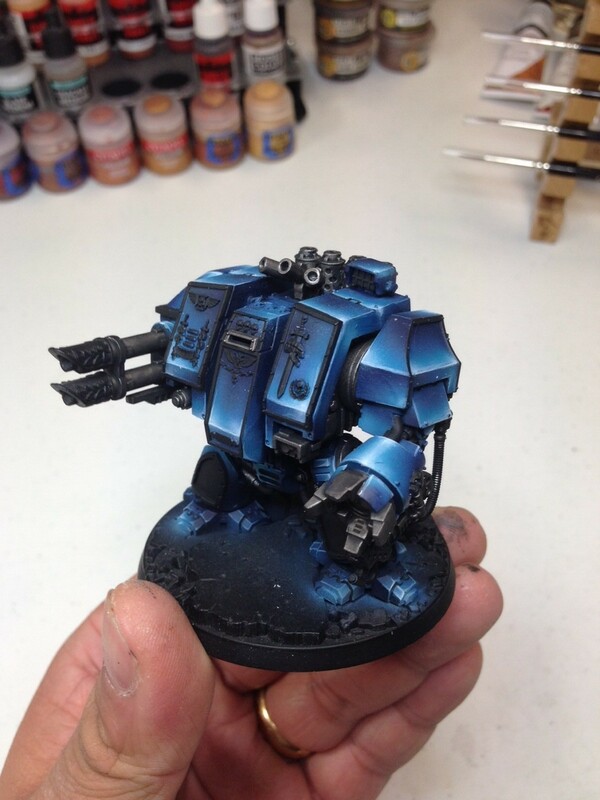 Both colours look similar and should be fine for this type of airbrushing.